Tattoos can be totally HOT. These, well, are definitely not. Tattoo failures are never funny … when it’s on you! (Haha!) In any other case, they’re pretty darn hysterical. Getting a tattoo should be treated as a HUGE decision, and you should always do your research beforehand — unless you want to give us a reason to laugh. So consider this your warning to think twice and always get a second opinion (from someone sober) before permanently marking up your body. Meanwhile, sit back, enjoy and laugh these tattoo fails until it hurts (and be thankful it’s not YOU on this list!). Here we go again with the misspelling of words that will forever be on you. Pretty sure she meant to say “Live Your Life” instead she now has “Live YOU ARE Life.” Call me a grammar snob. “Never and don’t give up.” Ever. But your tattoo never will. I thought long and hard about what to say about this, but I can't seem to figure out what this tattoo is. 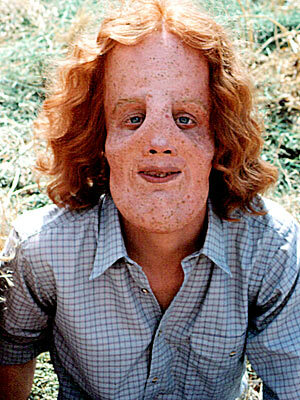 Best guess: Rocky from the 1985 movie Mask. But still, WHY? Great mug shot! With your lightning bolt — or wait — is that actually a Christmas tree? Oh yes! You’re sure to pick up all the ladies with this artistic masterpiece. Who drew it? Your 5-year-old nephew? Are you fearless or trying to work “les” by getting a hand tattoo? Corny, I know! But so is this tattoo. (And she even had enough fingers for the extra “s”.) SMH. I personally don’t, but hey not judging if you do! Dad's what? If I came home with this my dad would unquestionably be yelling at me … Our advice: This “aingel” should stay in school. This is painfully gross … yet kind of hysterical. And definitely 100 percent unattractive. Everything about this is wrong! WRONG WRONG WRONG! But at least it’s all spelled right. ... how I wonder why the eff you did this to your face.